Logging Problems within the CRM follows a similar process as Lead creation. You can add notes, recall Problems and progress through certain statuses; documents can be created and added to the Problem as required. The way in which they are recorded allows you to report upon these to help better manage your products or service. 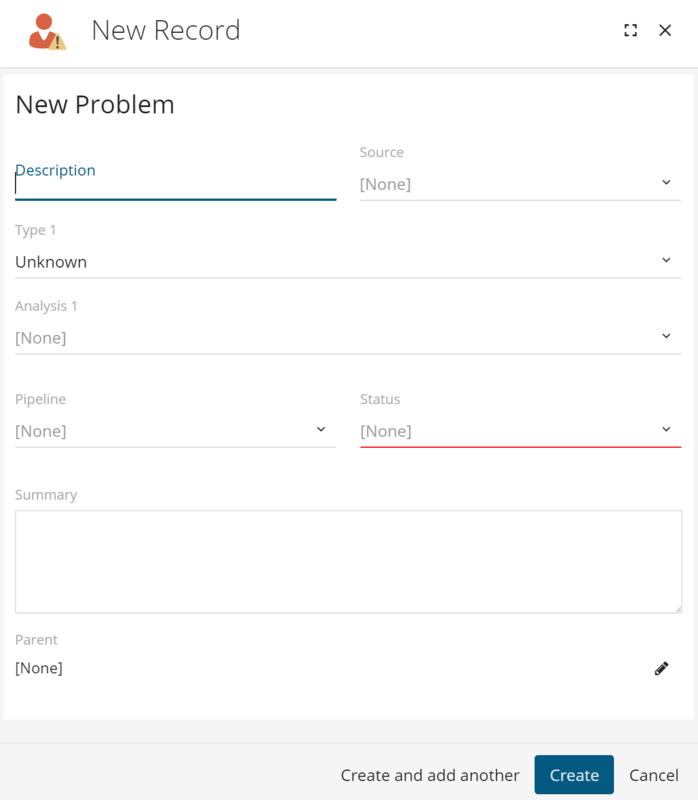 A Problem can be logged under a Contact, Division or Lead within the CRM and is done by selecting the + icon and then picking Problem from the drop down. 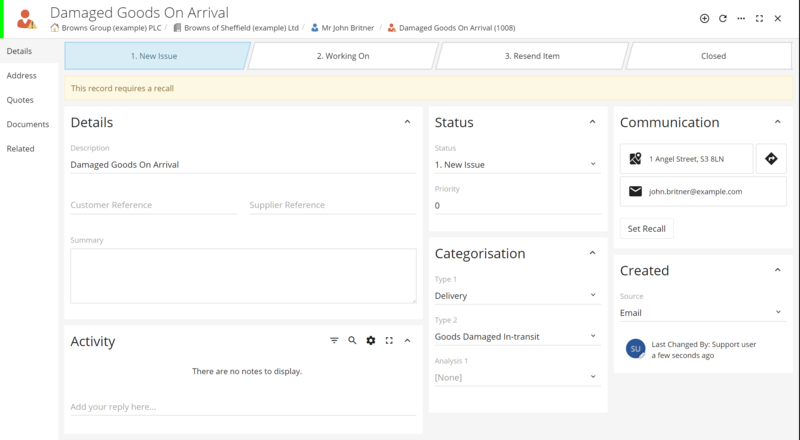 The New Record window, shown below, will automatically open where you can fill out various information about the customer issue/query. Description: The description should summaries the customer's issue or query. It is important to ensure this is relevant, so other users of the CRM can clearly identify & find the problem record. Source: Here you can record how you the customer contacted you regarding this issue or query. Types: The Type drop downs are there to help you categorise this particular issue or query. Analysis: The analysis provides you with another drop down to help record additional information about the ticket. For example, you may wish to record if they have a contract with you or not. Pipeline: Problem Pipelines should depict your customer service process using statuses as the different stages of that process. Please note you can have multiple problem pipelines, if you have more than one customer service process. Status: The status will be determined by the Problem Pipeline selected. Summary: Within the Summary you can provide a brief overview of the issue/query being logged. Once you are happy with the options you have selected, just press Create at the bottom and you will be taken to your new Problem record. Priority: A number can be given to the Problem to help determine the priority order in which it needs to be completed. Customer Reference: If you have a customer reference system when a ticket is logged, then you can record this here. Supplier Reference: If your supplier such as your courier provider gives you a supplier reference, then you can record this information here.